Known by superstitious actors as "the Scottish play," William Shakespeare's "Macbeth" remains one of the most renowned dramas ever conceived, and is still regularly performed hundreds of years after it was written. Within the play, the character of Macbeth, the future king of Scotland, meets a trio of witches who make some prophecies that predict Macbeth's future and cause him to take actions that result in these predictions coming horribly true. In the first act of "Macbeth," Macbeth encounters a trio of witches, the "weird sisters." They tell Macbeth he will be "Thane of Glamis," "Thane of Cawdor" and "king hereafter." They further announce they will greet him again "when the battle's lost and won." They then recite in unison, "fair is foul, and foul is fair." 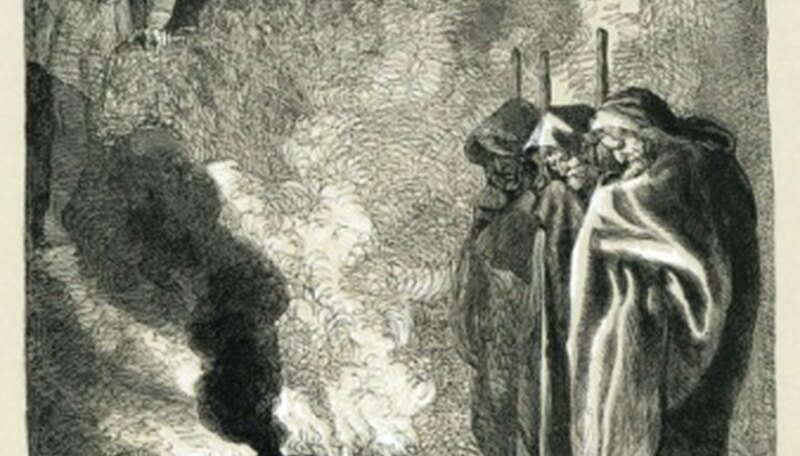 Later in the play, Macbeth again meets the witches, who summon three ghostly apparitions, each of which offers a prophecy involving Macbeth's future. The first apparition the witches conjure up is a disembodied head, wearing an helmet made of metal armor. This ghostly entity warns Macbeth to "beware Macduff; Beware the thane of Fife." This is a prophecy that Macduff will eventually return to Scotland and make an attempt to try to ruin Macbeth in some way, or even kill him. Ultimately, this prophecy foreshadows Macbeth's death at the hands of Macduff. The second apparition is a bloody child, who gives Macbeth the following prophecy: "For none of woman born shall harm Macbeth." This initially seems to be a prophecy that Macbeth will remain invulnerable to anyone who tries to kill him, especially Macduff. However, this prophecy comes to foreshadow Macbeth's death by Macduff. The play later reveals that Macduff did not have a natural birth, but was "ripped from his mother's womb," implying he was born by Caesarean section. The final apparition the witches conjure is another child, this one holding a branch. This apparition tells Macbeth he will not be vanquished until "Great Birnam Wood to high Dunsinane Hill shall come against him." This foreshadows the the attack on Elsinore castle when troops use the branches of trees from Birnam Wood as camouflage until they sneak into range and are close enough to mount their attack.